I’m one month into my rewrite of book #2 in the civil war series starting with the battle of Shiloh. Major General Henry W. Halleck set his plan in motion the beginning of May, 1862 a month later than he’d planned thanks to the untimely intervention of Albert Sidney Johnston’s surprise attack on Grant’s Army of the Tennessee at Pittsburg Landing or more commonly known as Shiloh. 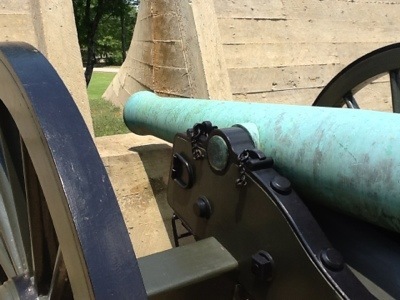 This campaign is little known, not important enough to rate a history of its own and of the fortifications built no longer exist around the modern town of Corinth, Mississippi. You can find a fine history of several battles part of the western Tennessee and northern Mississippi fighting in Peter Cozzen’s Iuka and Corinth book but otherwise this is just a foot note in the history of the region. My writing on book #2 started around this time last year when I was only writing fitfully on the weekends when I made the time. I didn’t set any goal, I just started writing. It wasn’t until this year that I started applying a daily word count that I finished the WIP and began to make notes on a printout copy, small edits in sentence structure and overall plot. I won’t do a line edit (that’s for my editor to do) but I will do several passes looking for specific details. In my initial WIP at the beginning I trashed whole sections of the initial start because I just didn’t feel the story any longer. I write by listening to the story and sometimes I stop listening and go off on some other path and sometimes I stop myself. I wrote out two characters in those early chapters only, later on, to write them back in but with a different start. I even wrote in a new character, a former slave hunter to explore an obviously unlikable character who would be the center of much of the story to see if he could be rehabilitated. My rewrite has entered the less boring stage of applying the notes and changes from the print out to the electronic file to the addition of brand new content. One character I excised early on is now back and on the brink of the beginning of the Corinth siege campaign. The Army of the Ohio will spend the next month (May 1st to May 29th) making short marches and digging in as Halleck cautiously moves and maneuvers his armies to within a mile of the Corinth fortifications and all the while promising Secretary of War Stanton he intends to take Corinth in one gallant rush. The truth is Halleck never intends to attack but to try and force Beauregard to either attack him or hole up in the city and eventually be cut off from his rail road supply lines. Other than skirmishing, there is no real major fighting. So, why Corinth? Why is it important when no one else sees it as so? Because for a soldier in the Army of the Ohio at the time, as my Philip character is, it was deadly work and something they would have had to experience as time went on. It is part of the soldier narrative to experience the mundane and the trivial with the important and deadly. It is also something that has to happen to get my character from point A, the survival of Shiloh in book #1 and to where I needed him to be for future books. See, I had a problem with book #2, nothing was happening after Shiloh. The civil war in the west after Shiloh was one of maneuver and strategic movement over tactical battles like Shiloh. So, I thought I would be writing a novel about Stone’s River, something that happens late 1862 and early 1863 but one book has turned into six and the time frame needed for #2 was either going to leave out too much from this time period or be way to long. I rely a lot on the War of the Rebellion collection of after action reports and correspondences between the field commanders and their superiors for the detail I weave into the story lines of these novels. I like to maintain a historical reality for my characters and have something of the mundane, like changing one’s campsite due to unhealthy conditions, as a framework for change. These are the details I can only find in these reports and correspondence during the war. The changes to the 2nd novel have been guided somewhat by these details that send the gears in my head turning as I attempt to follow some logical progression to tie things together. It has been an adventure, this second book through the multiple rewrites and changes with characters that I can only hope have been part of the making the novel better.